The city of Chicago in the state of Illinois stretches 29 miles along one of North America's great lakes, Lake Michigan with the Chicago river running through it's heart, the Loop. It is a modern city comprising around 77 neighbourhoods from inner city to suburbia and is architecturally impressive. The history combined with the inner city buzz of office blocks, shops, boutiques, bars, museums, restaurants and theatres makes Chicago a busy and interesting place to visit. The tallest building in the United States and the world's 3rd tallest building is on Wacker Street in the Loop. 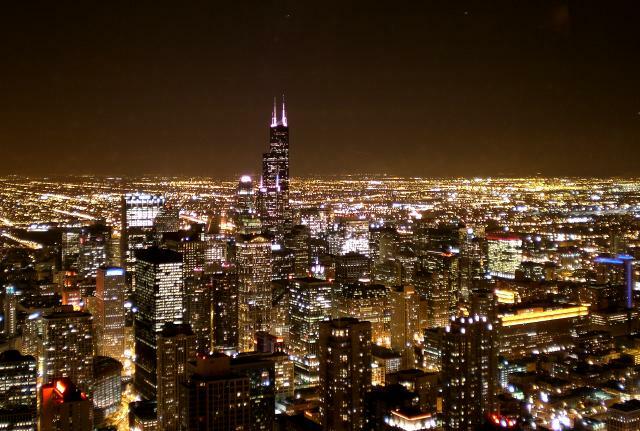 It attracts over a million tourists a year to its skydeck for panoramic views of Chicago. It has 110 floors and is capable of swaying in the frequent and strong Chicago winds. An entry fee is payable and expect to queue, especially in high season. This impressive building is a 1127 foot tall skyscraper completed in 1969 and named after the first person to sign the historic United States Declaration of Independence. It is the 3rd tallest building in Chicago. The building is a combination of offices, shops, restaurants and residential apartments. The Signature lounge and restaurant on the 96th floor is one to put on your list. From the lounge you can take in the impressive night sky line while sipping a beer or two! This long stretch of North Michigan Avenue is where you will find over 900 shops including boutiques and world renowned designer brand names, fine dining, the John Hancock Building and the Historic Water Tower nearby. This great and beautiful building is just over 150 feet tall and houses a tourist information office. It is one of the structures that survived the Chicago fire of 1871. The bridge itself is a bascule bridge and the area around it is a great spot to stroll around and take in the great architecture dissected by the river along Michigan Avenue. The Wrigley Building has two towers, each are of different heights and were built in 1919 and 1924. It is made of 6 colours of white glazed terracotta and has a clock tower that is two stories high. Opposite the the Wrigley building is the gothic Tribune Tower, home to the Chicago Tribune newspaper. The building was completed in 1925. Navy Pier is on the edge the city on Lake Michigan and is one of the most popular tourist attractions in Chicago. 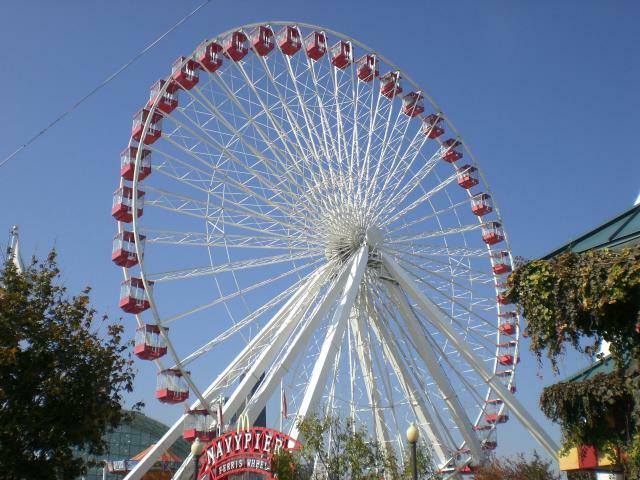 There are a number of places to eat, plenty of shops and an amusement park with a popular 150 foot high Ferris wheel. The Chicago Children's Museum with educational exhibits for children is also located in the Pier. The views of Lake Michigan and the entire downtown city are excellent from Navy Pier. The financial hub of the city is known as the Loop and is approximately 1.5 squares mile in size. Since Chicago is the world centre for commodities, futures and options trading, there are numerous big corporations and companies with offices or office blocks in the Loop. The modern Millenium Park is one of the latest additions to Chicago and is over 23 acres in size for visitors to walk or cycle and view travelling exhibitions. 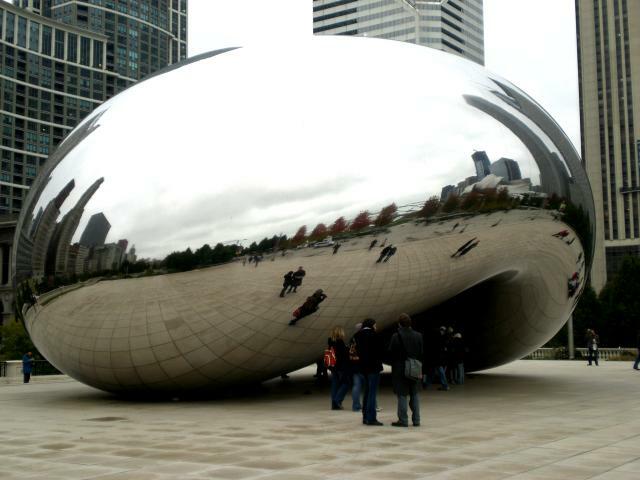 There are also a few pieces of interesting modern art in Millenium Park including the Cloud Gate sculpture with it's interesting reflections! This world class art museum is flanked by Grant Park (with its Buckingham Fountain that lights up the summer night skies) and Millenium Park. The Art Institute of Chicago has masterpieces from around the world and has a number of pieces from China and Japan, Greece, Egypt and Rome. The park is named after Abraham Lincoln and is one of Chicago's many lakefront parks where locals go running, walking or simply relax. In summer there is a fresh produce market here on Wednesdays and Saturdays. Lincoln Park Zoo has over 1600 animals to see with entrance to the zoo being free. The Old Town is a residential neighbourhood in central Chicago near Lincoln Park with tree lined streets of desirable houses and apartments and a few nice restaurants. The home of the Chicago Cubs and a beautiful baseball stadium. The lake is enormous. Taking a boat tour of the river and Lake Michigan is a great way to see the impressive Chicago skyline from a distance. The lake also doubles as a playground with nice beaches in the summer, sailing, fishing, waterskiing and dining a few of the possible activities. Chicago is home to several professional sports teams. The Chicago Blackhawks play hockey, the Cubs and White Sox are baseball teams, the Bears are an American Football outfit and the Bulls play basketball. There are plenty of games happening year round to enjoy so check which sports are happening when you visit and join the fun. The cultural scene is alive and well in Chicago. Various plays and musicals hit the city every year, the Chicago Blues nightclub scene is moody and great international acts tour the city regularly. The city provides a premiere shopping oppurtunity. Most notably the Magnificent Mile's boutiques and shops where you can stock up on a few designer labels while you take in the sights. All your international favourites are available but try some of the local beers and support the smaller oufits. A city favourite, the Chicago style hot dog must be topped with mustard, relish, onions, tomato, pickle and peppers in exactly that order. Deep dish pizza is another city favourite and also pretty darn tasty. The best of Chinatown can be sampled just south of the Loop. For some touristy venues and typically Greek food, head out to Greek town for a nice lunch or dinner. Chicago is a popular destination for both business and pleasure so finding a hotel won't be too hard unless you visit in the peak summer season or during a large business convention. Many of the main hotel sites will have listings for you in Chicago. Find Chicago Hotels. Chicago has a few hostels and cheap accommodation options for budget travelers. Some are central, some are on the outskirts of town. Use our hostel booking system to find Chicago Hostels. The Windy City has plenty of short let apartments available close to the city center. You can try finding suitable apartments for rent in Chicago. O'Hare, one of the world's busiest airports, is about 45 minutes from central Chicago by train. Find out more about all the airports in the Chicago area with Fly Chicago. Chicago's "L" or elevated trains are a well known icon. As the trains reach the city, they run on elevated tracks about 2 stories up. Although many of the buildings along the lines block your view, a window seat is still desirable to take in a bit of the city as you get around. The bus system is also excellent, well developed, runs frequently and covers the city well. 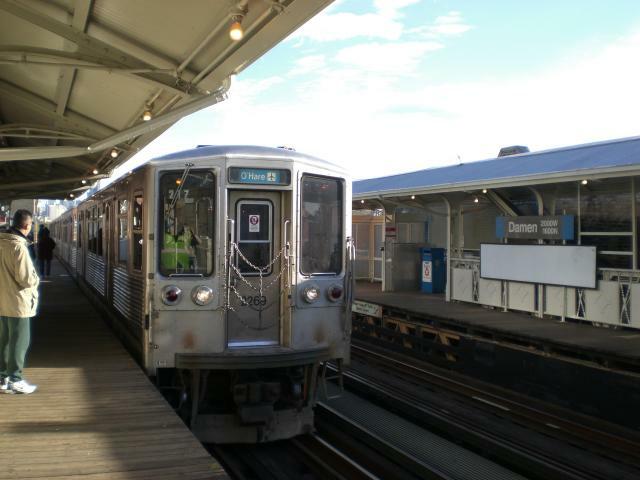 Research the public transport system and get more information and fare prices at Transit Chicago. Chicago traffic is quite busy. Parking charges and gasoline can make your driving experience a bit unpleasant but for the outer parts of town and driving along Lake Michigan, a car may be quite useful. Taxis are always an effective way around town, pretty much always available except around rush hour but a bit pricey. Walking around central Chicago is safe and a great way to take in all the sights and architecture of the Windy City. English is the main language but Chicago is a culturally diverse city with many Italian, Greek, Polish and Russian immigrants. US Dollar - $ - split into 100 cents. 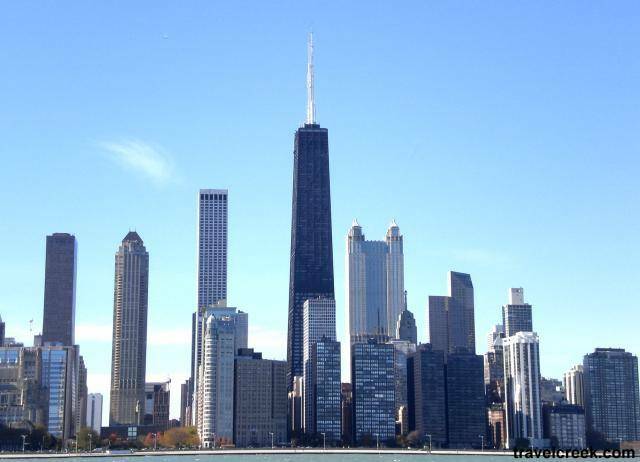 Chicago is in the Central Standard Time zone of the United States which is GMT -6 hours.